Sublative Skin Resurfacing offers patients of all skin types a safe and effective solution for taking years off one's appearance by gently resurfacing the skin while stimulating collagen production. This is a needle-free procedure with quick results and little down-time. Typically performed as a series of 3-6 treatments. Schedule now to set up your skin care consult. Safely and comfortably fade the appearance of skin imperfections caused by the sun, acne, hormonal imbalances and red spots (such as rosacea, spider veins and age spots). Typically performed as a series of 3-6 treatments. Schedule now to set up your skin care consult. Say goodbye to unwanted hair on all body areas, including upper lip, cheeks, chin, neck, breasts, stomach, arms, shoulders, bikini area, legs and back. The Elo¯ s laser combines energies to effectively and gently remove hair of many colors and types from all skin tones. Typically performed in a series of 6 treatments. Schedule now to set up your skin care consult. The combination of the IPL and Sublative laser treatments worked well for me and I was able to notice an improvement in my skin tone and texture within the first day. After a few days, I could see a difference in my skin’s brightness and tightness, especially around my cheekbone and under eye area. During the actual treatment, I experienced very little discomfort… And there is minimal down time…I was able to go to a concert the next evening. A: We ask that anyone interested in a laser treatment schedule a 15 minute consult before their first treatment. This allows us to determine personalized treatment recommendations & expectations, review contraindications and risks, and to perform a "test run" on the treatment site to ensure safety. A: Heat, via Radiofrequency, is precisely directed into the deeper layers of skin via a laser applicator, in the form of a matrix. The penetrated heat then stimulates a healing response within the skin. As a result, new collagen and healthy skin cells are produced. Mild to moderate wrinkles and superficial imperfections of your skin’s tone and texture are appreciably reduced and skin appears healthier and more youthful. A: Immediately following treatment, it is common to have a light (pink) “sunburn” appearance for 24-48 hours. As the “sunburn” appearance fades, your skin will have a mild grid-like pattern (from the matrix) typically for 7-10 days following treatment. The “grid” then sloughs off, revealing healthier, more rejuvenated skin.This is a no-downtime procedure and can wear mineral based make-up 24 hours following the procedure. Many patients return to normal activities immediately after treatment. A: Hair follicles are precisely targeted and destroyed using combination of bi-polar radio frequency and light energies. A: We cool the skin surface during treatment to improve comfort throughout the treatment. 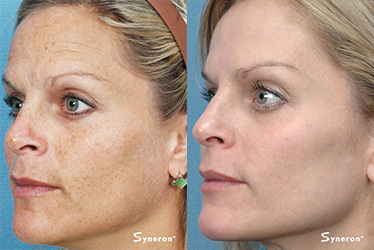 In addition, our E-los laser constantly measures the skin’s resistance to ensure safety and comfort during treatment. This is a no-downtime procedure. Many patients return to normal activities immediately after treatment.